Behind DeLappe's soccer-centric play is a tale of the hunger, honesty and heartbreak of modern female adolescence. Teenage girls are heavily associated with stereotypes, more often than not, negative ones. But Sarah DeLappe's "The Wolves" defies the preconceptions about what female adolescence looks like to paint a realistic and spirited portrait of what being a teenage girl actually is like. "The Wolves" arrives at the Echo Theater under Alana Dietze's attentive direction after productions at The Duke at 42nd Street and Lincoln Center. 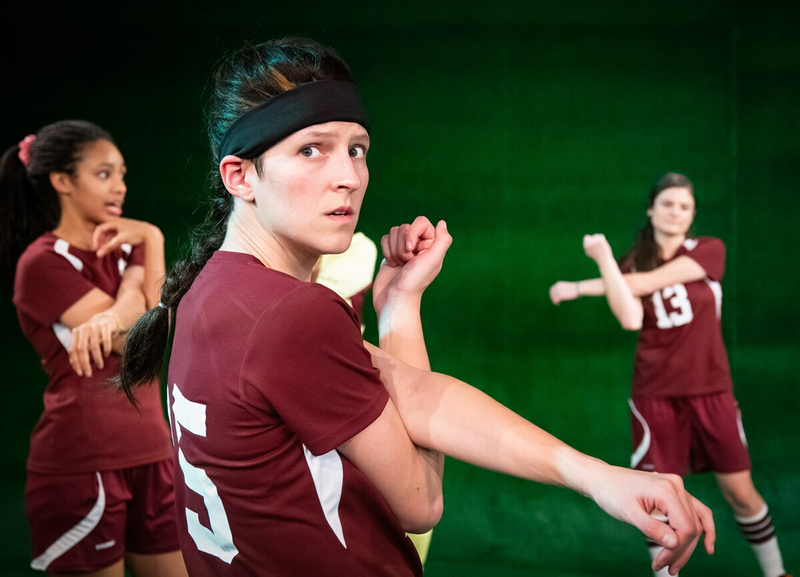 The play follows a female soccer team over the course of their season as they grow closer together and overcome personal and shared obstacles. Each of the characters is referenced by the team number displayed on their jerseys. This may seem initially seem impersonal, but the actresses bring to each of their characters an abundance of personal flair and mannerisms that make the audience connection to them anything but. Despite the repetition of their Saturday morning practices, there are plenty of variations that keep the staging fresh. Scenes are intercut with moments of exercise and Jeff Gardner's eclectic and upbeat transition music. Much of the blocking takes place as the girls warm up in a circle, but Dietze makes sure that the positions in the circle are changed so different girls are visible. What is amazing about DeLappe's writing, as well as the actresses' portrayals, is the depth these teenage girls are given. While they have their fair share of teenage rebellion and childish streaks, they also are incredibly intelligent and motivated. Adolescent girls in media are often represented as shallow, but these girls are filled with an extraordinary amount of depth and complexity that is refreshing to watch. The variation in the personality of each player also highlights how each of these girls, while all the same age, are at different points in their own journies of maturation and self-discovery. #7 (Katherine Cronyn)and #14 (Donna Zadeh) are immediately established as popular girls, ahead of their time, who swear and hang out with college boys. Then there are #8 (Ellen Neary) and #2 (Minzi), whose gangly, awkward and excited physicality resonate as young highschoolers audiences may have experienced in their own youth. #25 (Connor Kelly-Eiding) is tomboyish and athletic, #11 (Troy Leigh-Anne Johnson) witty and smart, #13 (Jacqueline Besson) both relaxed and silly and #00 (Makeda Declet) a silent and nervous overachiever. #46 (Caitlin Zambito) is an awkward newcomer who longs to find her way in the team. Despite their initial identifying characteristics, each character reveals more colors as the play unfolds. Each character never comes across as stereotypical or trope-ish, which is a testament to the work every individual in the production put into their characters. The production features many standout moments, but the most noteworthy were the most nuanced. With only one line, #14 was able to convey a rupture in her friendship with one team member.#2 frantically devours a bag of orange slices as the team runs onto the field. #00 goes through a range of emotions as she physically exerts herself to both a physical and mental breaking point on the field late at night. The sheer power behind these moments enraptured the audience and captured so much emotion in little actions. Watching how each character grows over the course of the play is truly fascinating and evokes relatable feelings of adolescence, of figuring out who you are. Despite the individualistic nature of the performances, the production also succeeds as an ensemble piece. Every girl is given a chance to shine and all harmoniously come together as a real team. When a team member is not present, their specific absence is felt, and the overall dynamic of the team shifts with every fluctuation in present team members. By the end of the play, a devastating loss shakes both the team and the audience. The interspersed chuckles and sympathetic sighs the audience exude over the course of the production slowly but surely grow into a genuine connection and affinity for the team before us. It is miraculous that in 90 short minutes DeLappe manages to capture such a realistic portrait of American female adolescence and Dietze and her cast can bring it to life with such delight, honesty and heart. "The Wolves" runs now through April 22nd at the Echo Theater. Tickets start at $34 or are pay-what-you-will on Mondays. More information can be found here.